X-Men: Gold #6 Review – AiPT! The Sentinel-based A.I.-enabled nanotech storm is laying waste to New York City, and it’s up to the heroes of the Marvel Universe to put a stop to it. Can the combined efforts of the X-Men, the Champions, The Defenders and the Avengers repel this swarming menace? Why is it that the X-Men are the only team with psychics? 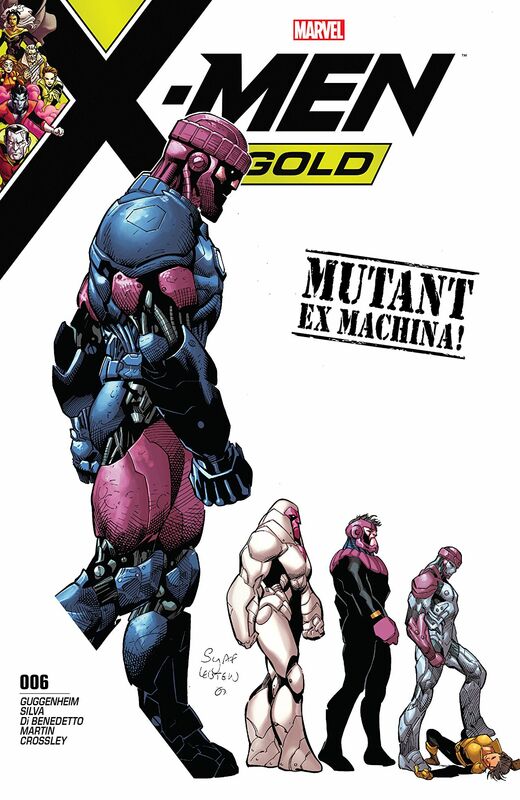 In this, the final issue of X-Men: Gold’s second arc, it’s clear that Marc Guggenheim’s agenda is to make brief, tight storylines that aren’t hampered by the necessity to advance a larger meta narrative (barring, possibly, the machinations of Lydia Nance). That’s not the worst plan, but the execution leaves a little to be desired. With such tight pacing, some ideas (read: most ideas) don’t have adequate time to develop, meaning broad character moments are either so poorly built that they feel unearned or are swiftly moved passed and ignored. In all, it leaves each story arc feeling like one of those “Monster of the Week” shows, where most story beats don’t survive past their initial appearance and are barely (if ever) mentioned again. This problem is most evident in the central framing arc surrounding Rachel’s crisis of confidence. The gimmick with the aforementioned nonsense Sentinel cloud is that, even though it can adapt to any physical assault sent its way (a legacy ability left over from the Nimrod class Sentinels), it is somehow weak to mental attacks. For whatever reason, the only major team still active in the Marvel Universe that includes a member with telepathy is the X-Men, with the Gold team’s own Rachel Summers undeniably the strongest among them now that Emma Frost has turned heel and Quentin Quire has been benched to Jubilee’s Generation X squad. So how do you create some conflict for the most powerful psychic on the planet and former host of the phoenix force? You give her a previously unmentioned confidence problem that she overcomes 15 pages in in order to deus ex machina the bad guy away. It’s the rare double whammy of being both an unearned conflict and resolution. Now the visual representation of this process is actually pretty cool, with Rachel either hallucinating or somehow conferring with the astral projections of her future-yet-also-former husband Franklin Richards, her revered mother Jean Grey, and her recently deceased father Cyclops. Each character provides a bit of a grade-school pep talk about how Rachel is afraid of her own potential, with the interactions growing increasingly empathetic as the issue moves on. Unfortunately, this means that Franklin sort of comes off as an a-----e in his segment, and even Jean comes off as distant and disaffected to her daughter’s struggles. The fact that her father, who during their final interactions prior to his death had a somewhat combative relationship with his daughter, was the one to convince her to embrace her potential rather than her mother (who, let’s not forget, changed her legal name to honor her several years ago) feels like poor scripting. A missed opportunity I suppose. Another odd missed opportunity comes around mid issue when Storm kisses Gambit while they’re fighting off the Sentinel cloud. Like Rachel before him, Gambit had been struggling with guilt from thinking he had caused the madness that was gripping the city. Again, unearned. They didn’t talk about this last issue, Gambit didn’t express remorse over his release of the nanobots, and even when they bring it up in this issue, it’s all covered over the course of one page–from conception to resolution. Even more ill advised, Storm treats Remy’s uncertainty by kissing him and that solves the problem. Now Gambit isn’t the classiest individual, but he and Storm have been really close friends for years, and (in my opinion at least) have never given off a “will they won’t they” vibe. This is a notable development for two major characters in your central continuity (one of which is a key figure in your main cast) and yet it’s dropped as quickly as it’s introduced. Much like the other interesting-but-underdeveloped plot points of the series thus far (the resurrected Pyro and Avalanche, the X-Men’s monetary struggle with their relocation efforts, Kitty for some reason imprisoning that mute lizard guy, etc.) I doubt this will ever really be touched on again. On the positive side, this is a great issue visually. Silva works well with a wide and diverse cast, and with the fracas in New York drawing the attention of the Avengers, et. al, he gets a chance to show off a little. His action sequences are phenomenal and the background shots of some of Marvel’s favorites mid-melee with some evil drones make me curious what he could do with a book like Champions. It’s not perfect, mind you–his Captain Marvel is built like a bodybuilder in one panel, and the character’s familiar “athletic but reasonable” body type the next. Elsewhere, there are the same disappearing face problems as before, a Cecilia Reyes who looks pretty different from past depictions, and some indistinct injuries inflicted by the Sentinel cloud, but it’s overall a strong outing for the Brazilian artist. I’m curious about the direction for Rachel moving forward, given her state at the end of the issue, but I worry about the series as a whole. The first arc was a dumpster fire, but this second one has had moments of positivity from Guggenheim, so hopefully this is just a feeling-out phase, and this next arc will see him hit his stride and produce more than mere moments. Overall, this is a strong issue despite some challenging scripting. Guggenheim has shown promise recently, but Silva’s the star of this show. Silva works well with a large cast, creating compelling action scenes. Trying to cram too much into single issues means too many ideas end up underdeveloped.